My forecast has been for a powerful Inflationary Recession to occur, a consistently laid out analysis, delivered during the last year or more in clear terms. That has been my call, and continues to be my call. The Deflationist camp is making more noises. They do not know their limitations, which are obstructed by a blind eye toward the monetary inflation. They do not understand it, so they ignore it, and attempt to encapsulate it into a convenient bottle set aside on the margin. Gonzalo Lira will be proved wrong about price inflation showing on the official Consumer Price Inflation index. So what? The prevailing price inflation will ramp past 12% easily as he also predicts. His style is wonderful, even if a mirror is a fixture at his desk. His details in argument are strong and cogent. An anger meter is a fixture at my desk. So what? A patch firmly placed over one eye is a fixture for Rick Ackerman. In truly remarkable fashion, he seems incapable to realize that the US Federal Reserve has been the mammoth fountain of money to produce price inflation. His challenge is shallow in my view, since almost $3 trillion has been spewed into the financial system so far by the USFed, with more to come. 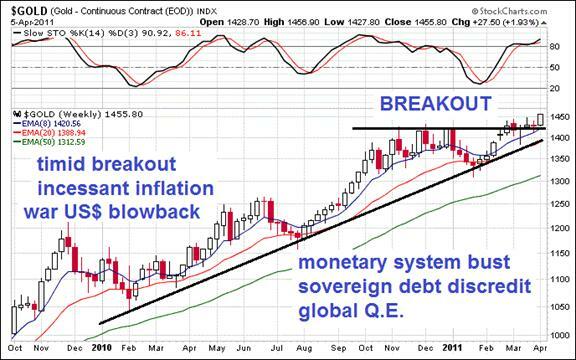 In fact, since the emergency G-7 Meeting held two weeks ago, the central banks have joined forces in a Global QE movement that will propel the Gold & Silver price much higher and render deep further damage to the USDollar. The Deflationists paid no notice, or did not notice, or did not comprehend the importance. They are a laughing stock crew of half blind shamans. Obviously, we cannot have a Weimar-style hyper-inflation. We do live in a credit based global economy. But the reasons why differ since the current global situation is different. The Weimar conditions were local to the microcosm that was Germany. It was enclosed. The current situation has its Weimar elements, especially endorsed by the recent March G-7 Meeting. That is global Weimar by any name, given its global coordination of USTreasury Bond purchase after broad discharge from Japan. The Deflationists cannot comprehend a global Weimar concept. Ackerman makes an astonishing claim that exposes the blind eye and ignorance to current conditions outside the US Dome of Perception. His eloquence should not be confused with wisdom. A good vocabulary and command of words cannot hide wrong statements that ignore the facts and overlook the trends. He wrote, "Let me cut to the chase: Hyper-inflation occurs when people, fearing their money is about to become worthless, panic out of currency and into physical goods. This is highly unlikely to happen in the United States for several reasons. To wit: 1) Whereas Germany's hyper-inflation took several years to ramp up, today's financial markets are primed for a catastrophic collapse that could conceivably run its course in a week, if not mere hours; 2) under the circumstances, there would be no shifting of financial assets into hard goods simply because any financial assets one holds at the time of the collapse would become worthless before one could sell them; and, 3) at that point, there would be insufficient currency available to drive a hyper-inflation, since mattress money is likely to be scarce and because branch banks keep only about $25,000 to $50,000 in cash on hand. All of which implies we will go straight to deflation without the emancipating, hyper-inflationary interlude that some mortgage debtors might be hoping for. Until now, I have been reluctant to air the simplistic argument, used by economists when they are at their most condescending, that inflation implies nothing more than an increase in the money supply. Although that is a truism that we would not argue with, it holds little value for anyone attempting to predict how a drastic increase or decrease in the money supply might play out symptomatically. While the textbook theory of it could account for the gas & groceries inflation that QE1 & QE2 have produced so far, it fails to explain logically how we would go from grocery store inflation to systemic and pervasive hyper-inflation. To repeat: Hyper-inflation would require the shifting of cash money into physical goods and assets. But other than mattress money and the relatively paltry sums of cash on hand at branch banks, there would be precious little cash to shift. And if the panicked money is assumed to come out of Treasurys and other paper assets, it begs the question of how much the paper assets will fetch on the day when there are no buyers other than the Federal Reserve? My argument is simple. I will not yield ground to any hyper-inflationist who fails to explain, if the system collapses, where the money will come from to bid tangible assets skyward." (footnote: do not trust any analyst who writes "to wit" just like do not trust any banker named Jamie). The focus of my attention here is Ackerman, but similar criticisms are due for Karl Denninger, Mike Shedlock, Jay Taylor, and Ian Gordon. The Gold price has danced above the $1440 resistance without much conviction or gusto, but certainly enough to warrant calls for a golden breakout. But Silver, WOW! How impressive! Take no prisoners, that Silver Streak! Bob Moriarty of 321Gold made a silver price top declaration at the $34 mark about one month ago. As editor he even refused to publish an article by a bright fellow analyst who was forecasting a move in Silver to the $40 mark (not me). The word censorship fits. Then BobMo casually proclaimed the $38 price to be the new Silver top. One must wonder if he has become the new Prechter in the gold community, whose calls for a gold top at $600 and at $900 and at $1000 and at $1200 and at $1400 have made him a laughingstock. Will BobMo the great censor, whose website serves more as a personal investment promotional rag, proclaim $42 to be the next Silver top, followed by $46 and finally $50 as the final final top?? He clearly does not comprehend the gradual destruction of the global monetary system, or the tremendous volume of the monetary inflation with USDollar footprints, the discredit of sovereign debt, the diversification out of the USTBond, and the global revolt against both the USDollar and the Anglo banksters. That is ok, anyone can start a website. Witness a powerful Paradigm Shift where even editors miss the big picture. This systemic disruptive change and shift has been a topic in the Hat Trick Letter for almost three years, with a consistent message offered. And yes, the Deflationist Knuckleheads never address this Paradigm Shift. They are dull blades one and all, beset by blind eyes, although a couple are eloquent in forming sentences. They must realize their limitations. A bright colleague remarked this week about the interplay between Gold & Silver, and how the shiny white metal takes advantage of the high level battles. He is a veteran COMEX trader and valued colleague. He wrote, "The price of Gold is totally intertwined with the dollar and thus all Western currency. I have seen some lines drawn in the sand with Gold over the years, but this is one of the most concerted and coordinated I can remember. As demand continues to push the price up relentlessly, and the Boyz rally around to cap it, the hot money runs in Silver." Very true even this week. Notice that when the Gold price was pushed down from $1445, the Silver price refused to budge in the mid-$38 range. Silver provided the signal of new imminent highs for both metals. In the next two days, Gold moved upward past $1460 while Silver broke to a strong clear new high approaching the exalted $40 level. Gold wins the political battles, while Silver takes triple the spoils. That pattern will continue to unfold. Whatever percentage gain Gold registers, Silver will register triple that gain. The shortages are acute and openly recognized for Silver. Analysts like Max Keiser have brought attention to the Silver potential, urging citizens to purchase silver coins and bankrupt JPMorgan. Such rallying cries seem enthusiastic and full of vitriol, but they also seem naive on the desired outcome of a toppled titan, since the JPMorgan losses will be monetized by the USFed and USDept Treasury easily. Did they not monetize the big bank losses in mortgage bonds? To be sure, a global citizen movement to purchase Silver coins will render damage to JPMorgan, which will pass on the losses like dirty diapers to the USGovt, the eager storage center custodian of toxic effluent. The acute Silver shortages are in front of our noses, in the news, and point to extreme vulnerability in the USDollar, if not the USGovt debt condition. The USMint in possible illegal manner has at times suspended the production of Silver coins to be minted. They by law are commissioned to continue to meet public demand, which means they must bid up the Silver price if required. The COMEX shortage of Silver is so widespread and in the open, that futures contracts are being settled in cash, after the contract owner signs a waiver to permit the breach of contract itself. A 25% to 30% cash settlement bonus has become the norm. Such actions in policy have lit a fire under the Silver market and lifted its price. Angry from incessant charges of currency manipulation, the Chinese have responded by purchasing large truckloads of Gold & Silver. 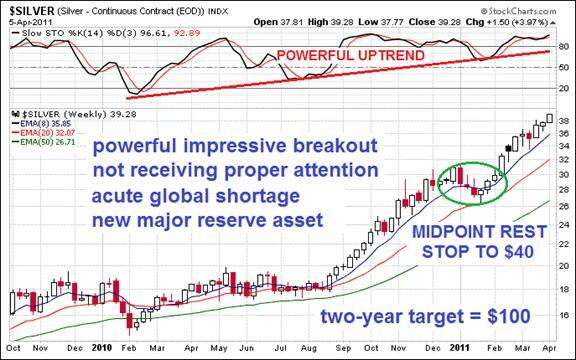 The real manipulation is by the USFed, whose debt monetization has gone global, whose USDollar effect is undeniable. That is blatant manipulation of not only the sovereign debt, but the currency denominated in it, extending to the entire monetary system. The group of major fiat currencies are all attached like a floating papyrus bound by threads. They are discredited in unison, weighed down by a debt burden and rotten paper. "When I initially read your writings, they provoked a wide range of emotions in me from fear and anger to outright laughter. Initially some of your predictions ranged from the ridiculous to impossible. Yet time and again, over the past five years, I have watched with incredulity as they came true. Your analysis contains cogent analysis that benefits from a solid network of private contacts coupled with your scouring of the internet for information." 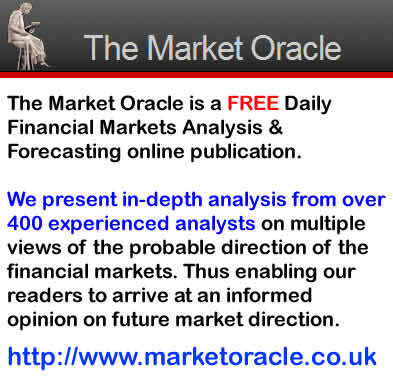 "Your analysis is absolutely superior to anything available out there. Like no other publication, yours places a premium on telling the truth and provides a true macro perspective with forecasts that are uncannily accurate. I eagerly await each month's issues and spend hours reading and studying them. Many times I go back and re-read the most current issue just make sure I did not miss anything the first time!" It's fairly obvious to most thinking people that the US and world economies are heading for a train wreck, but until now it's been difficult to predict the timing and even the short term consequences of Bernanke's actions. Ultimately this is about the decline and fall of the US empire and the transformation of the US economy into that of a second class world power, but this isn't going to happen overnight. But now it seems obvious to me that even in the short term (less than a year or so) we are going to be on a very rocky economic and world political road, and that President Obama has very little chance of being elected in the 2012 presidential election. The presidential election is a year and a half away. If Obama really thinks that the US economy will improve during that time period and this will help him be re-elected (as he has stated), he is lost in Ben Bernanke’s wonderland! (It’s often the case that propagandists end up believing their own propaganda). The federal government (under Obama’s direction) is on a downhill toboggan ride to hyperinflation, and any actions strong enough to stop this (if any such actions exist) would dump the country into a great depression. Time is not on Obama’s side. A few examples of the many problems he is facing? The federal government is financially unsustainable and is getting more so every day. The vast majority of state and local governments are bankrupt and getting more do every day. The housing market (which precipitated the current crisis) continues downward, with dropping prices and soaring foreclosures. Inflation? In one month (Feb.), the prices of finished goods rose 1.6%, last month the the price of crude goods rose 3.4%, and the world-wide prices of food and petroleum are skyrocketing. All this, and the insurrection crises in North Africa and the middle east, the nuclear and natural disaster crises in Japan, and who knows what’s coming next week? There is one straw for a drowning president to grasp at–the number of US jobs is supposedly increasing–but one statistic out of context and in an area of unreliable, “adjusted”, and otherwise manipulated government statistics is meaningless. We would need a long and detailed explanation to understand what’s going on–-one or two short statements in a news summary just won’t get it. So I think that the failure of Obama to get re-elected in 2012 will be the first giant step downward to oblivion of the US as a world power (I realize that many people will view that Obama's re-election failure will not be a step downward, but rather a step upward).